And so last but not least we come to the 24pdr howitzer. 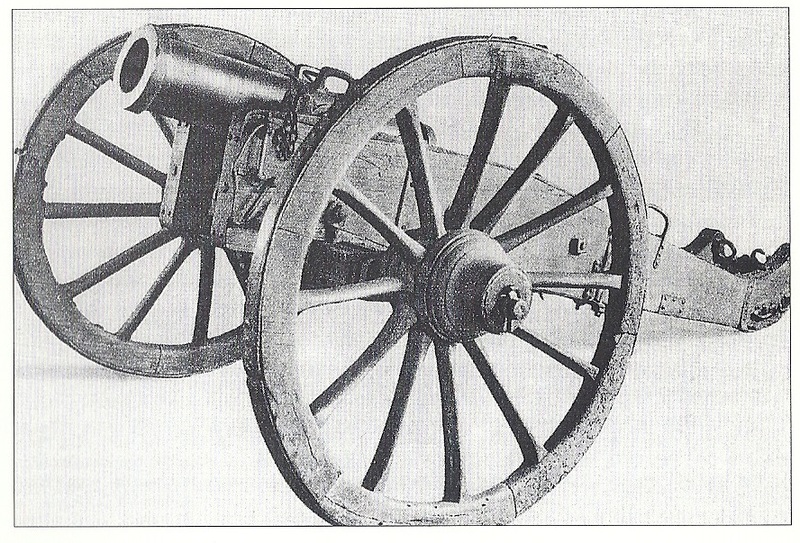 This became the standard French field howitzer in the Empire period, and it may have been the second most produced artillery piece for the French in the era, after the 6pdr, being in production from 1804. And yet until recently it has been nearly invisible to historians. No figure manufacturer has attempted to produce it in 15mm that I am aware of. Consequently this has been the single biggest modelling challenge in my project. This howitzer was introduced as part of the An XI artillery reforms, and seems to have been generally well thought of. It had a smaller calibre than the 6 pouce howitzer it replaced, but it had a longer barrel, and was more accurate. Napoleon was pleased that each ammunition caisson could carry significantly more rounds. Like the 6pdr it was virtually the same calibre as its Austrian counterpart, the 7pdr (150-152mm) – presumably allowing ammunition to be interchanged – though likely to be of different dynamic characteristics. It took its name, 24pdr, from the being the same calibre as the 24pdr heavy cannon. This was a new, rationalised naming convention that does not seem to have taken, though. Some referred to it as 5 pouce 6/7 lignes, but it seems to have been quite common to round this to 6 pouce, or inches, causing confusion to later historians. Since it was about 6 English inches in calibre, English observers called it 6 inch too. 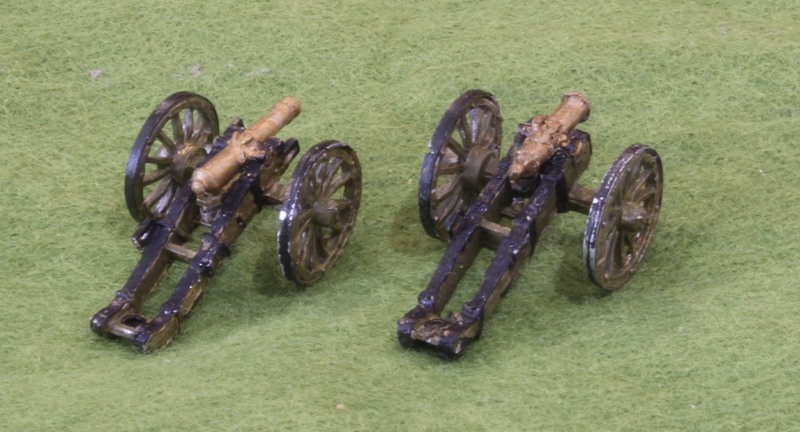 In the Royal Armouries catalogue the two examples they have (both captured at Waterloo and cast in or about 1804) are both referred to as 6in howitzers, the same nomenclature as the two much larger 10pdrs. Sadly there are no drawings of these two, and just basic measurements (a single length measurement and calibre) in the catalogue. It was quite distinctive of appearance, though. At 101cm (muzzle to breeech ring) the tube was about 5cm longer than the Austrian and Prussian equivalents. But the trunnions were further back, giving a barrel that stuck out well beyond the carriage, as the above illustration shows – quite the opposite of the 6 pouce howitzer it replaced. This picture is of one of the pieces captured at Vitoria in 1813 and now in Lisbon (a picture of it also appears in David Chandler’s Campaigns of Napoleon, inevitably referred to as a 6in howitzer). Did the design change as the wars progressed? DDS suggests it was modified. Indeed its table refers to two different howitzers: the “M1803 7-pdr” – calibre 151.5mm and 101cm in tube length, and the “M1808 24-pdr “,calibre 148mm and length 120cm. And yet I have seen no drawings or other pictures of the later piece. The Royal Armouries examples clearly conform to the former dimensions (allowing that their length includes the button at the rear), as does the photo of a “M1803 24-pdr” in DDS book itself. The drawings that I have seen in another publication are also of the early version. I need rather harder evidence of that the later design was ever in fact operational in serious numbers. And what of the carriage? This seems to be closely modelled on the 6pdr carriage. DDS carries a drawing of the “M1803” version. This shows a carriage identical to the 6pdr, alongside a drawing of a 10pdr barrel. Apart from the barrel being of a different piece, the issue with the carriage is that the elevating plate seems designed for the much longer 6pdr barrel. 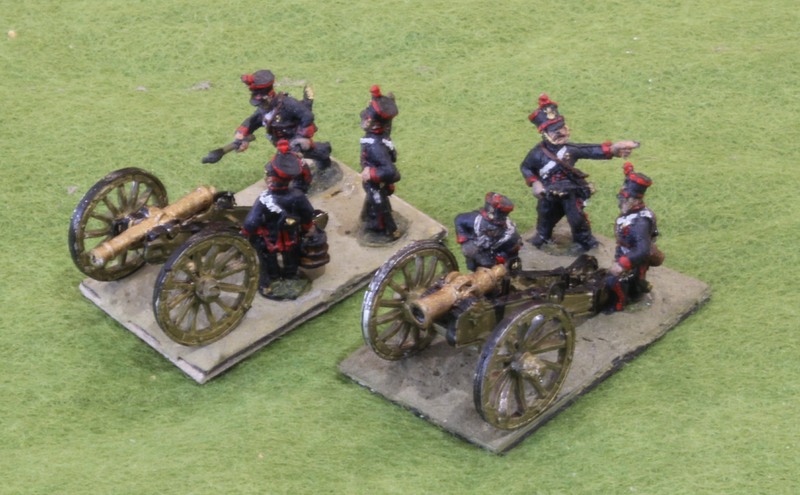 I would expect a much shorter plate for the howitzer, as we indeed see on the closely related later Prussian designs. The pictures of the 24pdr in Lisbon don’t reveal this detail, unfortunately, though otherwise the carriage design is consistent with drawing, allowing for the later addition of trail handles. But how to model this piece? I wanted three of them. The carriage is easy – the Blue Moon 6pdr carriage would be the logical starting point. But their Prussian 6pdr and Howitzer carriages would be nearly as good, as indeed would be the AB Prussian Howitzer carriage, assuming a shorter elevating plate, or the 6pdr for a longer plate. The Prussians seem to have copied the An XI carriage for their later artillery pieces, with even the reinforcing metal bands on the trail being in about the same places. For the BM models an elevating plate needs to be added (e.g. from plastic card), or at least the rear end. 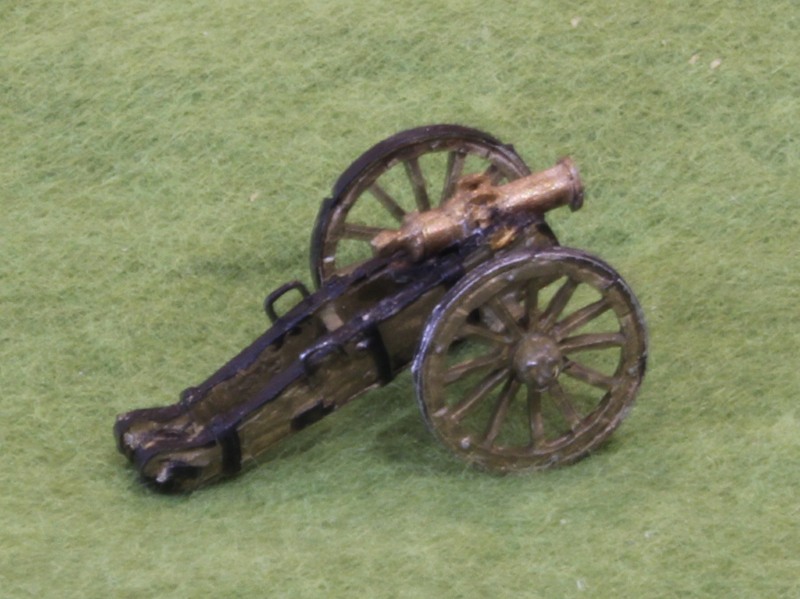 I had some spare BM Prussian howitzer models (from the pernicious BM practice of selling their artillery pieces in packs of 6), so I used these, adding trail handles from bent bits of staple. Also I cut out the two retaining bars for the ammunition case at the bottom rear of the trail. But the barrel? It is of unique shape, and I searched my bits and pieces for anything that could be adapted. The closest was the BM Prussian howitzer. But the trunnions are too far back, which means that the barrel does not have the characteristic projection from in front of the carriage. It is also a bit thin. I wanted the barrel to be noticeably thicker than the French 6pdr barrel. My first idea was to adapt the BM Prussian 6pdr barrel. This is quite thick (it does have the dolphins too – even though Prussians had eliminated these from their 6pdr in fact). I could saw off the ends, shorten the remaining barrel, and then stick the ends back on. I decided not to because I had it in mind to use these barrels for their original purpose – to play the part of heavy Prussian 6pdrs, to work alongside the beautiful AB 6pdrs, which would act as the light version. I also thought the area around the middle, which has a bit of a “saddle” would not be easy to replicate. In hindsight I think I made the wrong decision, though, and I may yet try to make an additional piece this way. But instead I decided to make the barrel from scratch! I took a piece of plastic sprue from a kit for two of the barrels, and rolled some Milliput epoxy putty for the third. On one I wrapped a slither of paper around the middle to get the “saddle”; for the other two I used some epoxy putty (grey stuff – I’m not sure which brand). Trunnions were added from a bit of plastic rod (from the same kit, which was a building). For the dolphins I fashioned something from putty for one, cut bits of plastic for the other two. For the rear I used the sawn off end of some old Minifigs 12pdrs. For the muzzle I used sections cut from a Minifigs artillery wheel hub, with quite a bit of filing down. All of which is easily said, but 1:100 is a small scale, and my fingers aren’t as nimble as they once were. And I didn’t find the putty that easy to work with (perhaps because mine is a bit old?). This was not a particulary neat or precise job. The trunnions and dolphins were particularly difficult – which is why I think my first idea was a better one. A further reason was that the barrel turned out to be a bit too thick. This is OK until it is put next to one of the other howitzer models, when it looks heavier than even the 10pdr. Never mind! One point worth adding is that the BM trunnion recesses are far too deep, which means that the barrel tends to go too low. I used a little bit of plasticine to sort this out – I didn’t find the epoxy putty easy to work with for this job. Here are the three types of howitzer together: the 10pdr, the 6 pouce and the 24pdr. in that order. You can see that the 24pdr barrel is too heavy in comparison with the other two. It is a tad over scale and the others a tad under. And here it is with the 6pdr gun (Blue Moon version), its normal companion. So what would I recommend for anybody that wants one of these to support their 15mm army? Straight out of the packet the closest fit is the Blue Moon Prussian howitzer. The barrel doesn’t poke out far enough, but actually the fit isn’t so bad. I would urge doing something about the trunnion recesses so the barrel doesn’t sit too low, and I would add an elevating plate under the barrel – advice that applies just as much to the Prussian version. If somebody quibbles you can always say it is a captured piece! The second alternative is to use the BM 6pdr and attempt the barrel conversion. You will need something to cut the barrel with though, like a jeweller’s saw. Using a knife has a tendency to squash the barrel. And that completes my collection. Something is gestating on limbers, but BM have recently released their limber models, and these are well worth a look. I will complete my series of posts with a wrap-up piece though, and some pictures of all the types together.